The Declaration is now gathering signatures before its official launch at the XVIII International AIDS Conference, Vienna 2010. There will be a media launch event at the conference on July 20th (see here for details and press release) and a discussion event around the Declaration featuring Evan Wood from the ICSDP and other invited guests, in the Global Village Human Rights, Harm Reducation and Drug Policy Networking Zone on Wednesday July 21st at 2.15-3.15pm. The Drug Policy Networking Zone is co-organised by Transform and the International Drug Policy Consortium. To visit the Vienna Declaration website and register your support click here. The site contains background information, press information and comments from some of the Declaration's supporters, inclusing Michel Kazachkine is the Executive Director of The Global Fund to Fight AIDS, TB, and Malaria. Transform is pleased to have had a role in the production of the Declaration as a member of the writing committee, providing editorial input and feedback on early drafts. Brought to you by the International Centre for Science in Drug Policy -- where science, not ideology, drives illicit drug policy. An internal Home Office memo, accidentally leaked to the BBC’s Martin Rosenbaum (see his blog here), today exposes a culture of playing fast and loose with Freedom of Information (FOI) requests that might expose Government policy to criticism. 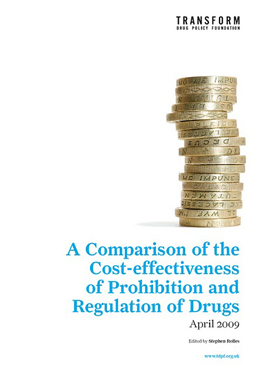 The fifteen-page document demonstrates in detail how officials at the Home Office discussed withholding a Home Office commissioned value for money study (of the UK drug strategy) from Transform because of fears of bad press for its much vaunted drug policy. The epic 3 year saga of how we finally obtained the VFM study is detailed here. The internal document was inadvertently sent to Rosenbaum (the deleted portions were still visible) along with a letter that the Home Office sent him as a part of an unconnected FOI request. It has allowed for a brief peep behind the curtain of obfuscation and spin that has characterised so many of our dealings with the Home Office. For reference the complete (inadvertently) leaked memo is on the Transform website here -unaltered in original Word document format. This is an extraordinary comment to write in a document like this as it so blatantly goes against the spirit of FOI. But more importantly demonstrates that the Home Office was not applying the guidelines that say that all FOI requests should be dealt with 'blind'. (i.e. not taking into account who has made the request.) . In this context it is particularly odd, indeed faintly ridiculous that the Home Office in response to Rosenbaum state that 'The Freedom of Information Act is applicant blind. Regardless of who the applicant is, all requests for information are assessed and answered in the same manner' - when this is obviously not the case as evidenced by the actual document they were being asked about. Bizarre. (See update below). A document is either exempt under the Act, or it is not. It is not for civil servants to make decisions about releasing information based upon its potential to provide ammunition for those challenging Government doctrine or policy. That is not and should not be the function of the Freedom of Information Act. The document even contained worked up reactive media positions, should the report eventually be released and recieve media attention. You have to ask: Shouldn't they be developing effective policy, rather than suppressing evidence, censoring criticism and working up reactive press soundbites? This is all reminiscent of the Government’s handling of the Prime Minister's Strategy Unit Drugs Report released in July 2005. 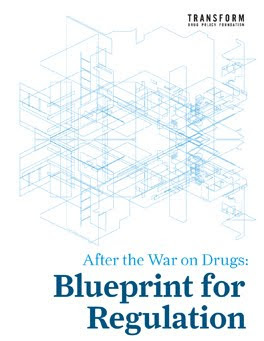 Ironically the NAO report and Public Accounts Committee report that followed it berated the Home Office for having nothing approaching an effective drug strategy evaluation framework, which was one of the key points the VFM review was making in the first place. One thing that this memo will hopefully do, is to bring the issue of drug policy's value for money to the attention of the coalition Government, and we have long suggested that the very obvious evidence vaccum could begin to be filled by conducting an Impact Assessment of current enforcement policy and related legislation. This ought to be a Government interested in Impact Assessment. In the current economic climate the Government's mantra is: 'What should we cut? You decide.' Well, what about at least costing out the war on drugs and comparing it with alternatives. Let's not forget that David Cameron called on the UK Government to initiate 'a discussion within the [UN] Commission on Narcotic Drugs of alternative ways—including the possibility of legalisation and regulation—to tackle the global drugs dilemma' as a back bench member of the Home Affairs Select Committee in 2001/2. Or that Nick Clegg's Lib Dem's Election Manifesto all but called for decriminalisation of personal use. Or indeed that Alan Duncan is the first member of Government to have written a book with a chapter advocating in favour of legalisation. Transform will be making official complaints to the relevant parliamentary bodies, not only to bring pressure to bear on those mishandling FOI requests with regard to drug policy, but also to encourage better FOI practice more generally for the future. 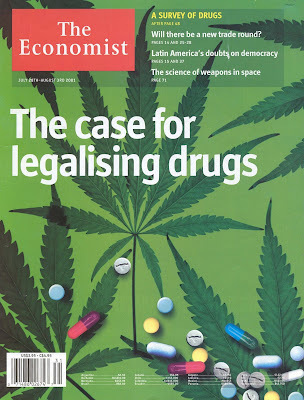 There is a bigger issue here that has nothing to do with drug policy or Transform. That said, if we are to move towards a more effective drug policy this culture of secrecy and suppression of evidence must end. The focus must shift from the futile defence of a broken and failed policy paradigm, to developing effective, just and humane alternatives. This can only be done in an atmosphere of openness and with a commitment to what works (for the public that is), not defending to the last what so obviously does not. Lastly, we are aware of another value for money document that has still not been released. Maybe releasing this and other relevant research would help draw a line under this depressing episode and signify a fesh start under the new Government, as well as obviously helping inform a mature policy debate based on evidence of effectiveness. That's not too much to ask is it? "The fact that the information may not reflect well on the public authority in question is not in itself a reason for it to be withheld." The following statement has been prepared by the Open Society Institute Global Drug Policy Program to mark this years UN World Drugs Day. It is available in pdf in a number of languages from the GDPP website here. Supporters are copied below. In too many countries, the “war on drugs” has become a war on people. Millions of non-violent drug users face abuse and imprisonment, while they have no access to proper healthcare or effective treatment. Low-level traders and producers receive sentences disproportionate to their crimes and languish in prisons around the globe. Millions more face crop destruction and police harassment as they struggle to make ends meet, with few alternatives as the global economy falters. Meanwhile, the HIV epidemic gains pace. Focus on reducing the harms related to drug trade and use, such as making needle and syringe exchange programs widely available. Decriminalize the possession of drugs for personal use. Ensure that evidence-based treatments for pain and addiction are widely available, including methadone and buprenorphine. Treat supporting farmers in moving away from coca or poppy cultivation as a development issue. Comply fully with human rights obligations in any drug control measure, ensuring proportionality of penalties, abolishing the death penalty, and avoiding non-evidence-based forms of treatment. Nearly three decades into the global HIV epidemic, we reiterate that driving people who use drugs underground only makes the transmission of HIV and hepatitis more likely. The number of HIV infections due to injecting drug use is rising steadily. In parts of Eastern Europe and South-East Asia, this figure reaches 80%. I Indeed, rather than a security-focused approach that costs roughly $100 billion per year worldwide, we need to look at this first and foremost through the lens of public health. In the blind effort to rid the world of drugs, 80% of cancer patients worldwide are denied access to opiate-based pain relief. A humane, compassionate approach to drug use based on harm reduction principles and respect for human rights is the most effective way to limit the negative impact of drug use, trade, and production. Scientific and medical research on best practices and cost benefit analyses overwhelmingly favors harm reduction programs, including needle exchange, drug substitution therapy, and condom distribution. We applaud countries who have already taken steps in this direction. Recently, both Germany and Switzerland have voted to make medical heroin available for chronically dependent opiate users and the new U.S. administration has come out in support of needle exchange. Ecuador pardoned thousands of drug ‘mules’ imprisoned with disproportionate sentences and 80 Argentinean judges made a public call to reform their country’s drug laws. In order to stop the spiral of drug-related violence and disease intensifying across the globe, more countries must follow suit. As part of its latest promotional campaign The Economist magazine has launched a series of 'where do you stand?' 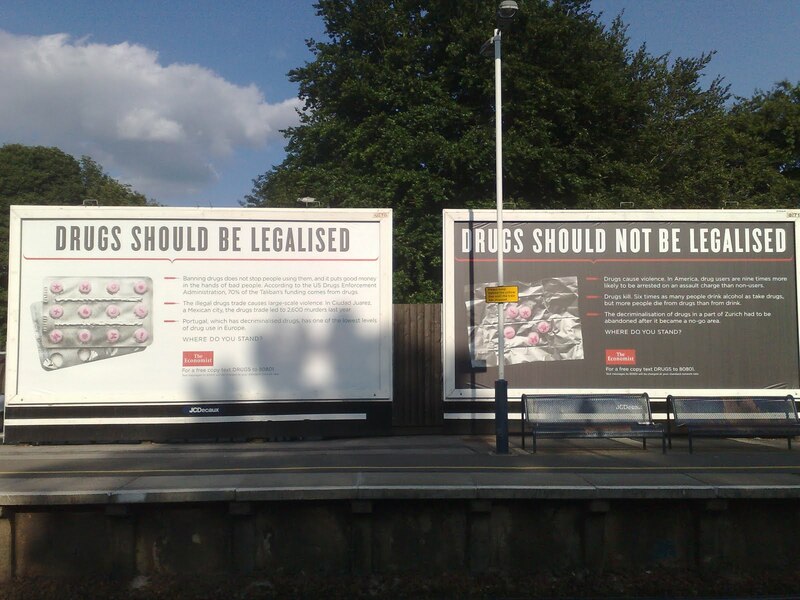 debates built around a billboard poster campaign outlining opposing views on a series of contentious issues. 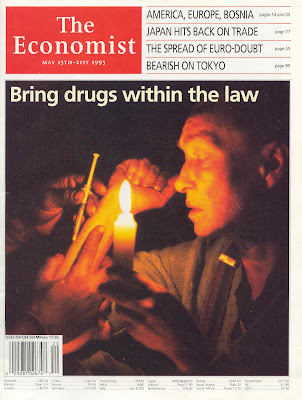 One of the issues they have chosen is whether drugs should be legalised and regulated, perhaps unsuprising given their prominent interest in this debate, and indeed support for the reform position (see below) over the past few years. The campaign is supported by series of twitter debates - the drug legalisation debate taking place tonight at 6pm (see @TheEconomist for details or follw the #WhereDoYouStand hashtag) and a facebook page where you can even comment with more than 140 characters, if not a fan of new media concision. Similar reports have run in number of other outlets including AFP (Billion Dollar cocaine seizure in Gambia), Reuters , the Daily Mail, and numerous others. There is a discrepancy in the reporting in the quantity seized, which varies from 2 to 2.5 tonnes, but all report the 1 billion dollar street value estimate, with the exception of PA that does not mention any street value figure, and also puts the size of the seizure at 2100 kg. It is not clear from the piece who made this estimate of street value - whether it was the Gambian authorities, the UK's Serious Organised Crime Agency (who were involved in the operation), although the AFP report suggests the latter. Either way it immediately rang alarm bells; the number not only seems conveniently rounded - one of those dramatic sounding media-friendly numbers that we see so often in drug stories (see here and here for example) - but also it was suspiciously big. A couple of quick sums. Two tonnes of cocaine amounts to 2 million grams. To get a street value of $1 billion dollars would mean that each pure gram was selling for $500, or £344 at current exchange rates. That seems somewhat high - given that UK 2009 cocaine prices are nearer £40 a gram, which would give a total street value of £80 million or $116 million. But this would not account for the fact that the street drug is heavily cut. If we factor in lower end average purity levels of 25% (itself a SOCA stat) this would give you a figure $464million. Even if we go with the higher 2.5 tonne figure (the 2.1 seems more likely, but anyway)- this would still take the street value to $580million - which remains some distance from 1 billion. Having exhausted all the available tricks: street value (at least x 10), purity (x4), convert to US dollars - even though its for sale in Europe (x 1.2), I'm still struggling to see how they could push the figure up to a juicy billion. Maybe the fact most 'grams' sold are a little under could nudge it up by 50 million or so, but the only way I can see they could have managed it is to base calculations on a cherry picked example of fantastically expensive/rubbish cocaine from somewhere in Europe. Who knows? (but we are interested to hear btw, should those concerned care to illuminate us). These sorts of (all too familiar) boastful statistical shenanigans can be seen to reflect the wider malaise in drug interdiction. In the face of their futile battle against an undefeatable enemy, there is a desperate need for enforcement agencies to demonstrate success, especially when the spending axe is hovering. Even if the street values are shown to be completely correct - there is still the relentless trumpeting of seizures to consider in the light of the rarely mentioned but relentless increases in availability and use that accompany them. Whilst demand for cocaine remains, and cocaine remains prohibited, organised crime will always find away to exploit the lucrative opportunity that this creates. They are an endlessly flexible, innovative and ruthless enemy. Localised 'success' will only ever shift transit routes elsewhere - as the shift from Caribbean to West African transhipment routes demonstrates. These seizures are Pyrrhic victories; the enforcers are inadvertently part the problem they are simultaneously trying to stamp out. There is a way to put the criminal drug traffickers out of business for good, but the key players in international drug control don't want to talk about it. The commentary reproduced below by Evan Wood of the recently established International Centre for Science in Drug Policy was originally published today on CNN.org. The news of intense drug-related violence out of Jamaica is shocking and dreadful but entirely predictable. 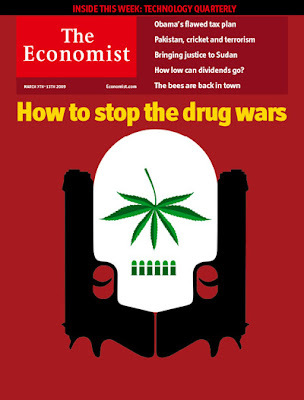 Wherever the war on drugs touches down, death and destruction result. A recent target is Kingston, Jamaica. Given that the scenes of violence between rival drug gangs are so common, people often fail to consider the factors that fuel this violence. The reality is that Jamaicans are just the latest victims in a misguided and expensive war that has taken countless thousands of lives, from the streets of New York to the slums and shantytowns of Colombia, Mexico and other third-world nations. When law enforcement attempted to smoke out Christopher "Dudus" Coke ... scores of people died in the urban warfare. Evan Wood is the founder of the International Centre for Science in Drug Policy; the director of the Urban Health Program at the British Columbia Centre for Excellence in HIV/AIDS and associate professor in the Department of Medicine, University of British Columbia. The opinions expressed in this commentary are solely those of Evan Wood.